There are many things that are unique to the United States. Unfortunately, one of them is the number of our children who are injured and killed when they find unsecured, loaded guns and fire them. These shootings are #NotAccidents. They are the direct result of an adult’s choice not to store their gun responsibly. 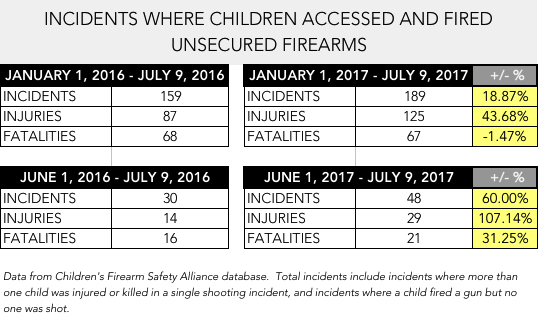 In the first week of July, there were fourteen shootings involving kids with access to negligently stored firearms. Seven of the kids died. The youngest was only 3-years-old. There has been an uptick in incidents this year compared to 2016. Although the number of fatalities remains close, the number of incidents and number of injuries have increased significantly. *Includes incidents where more than one child were injured or killed in single shooting incident. 28 children shot a sibling. 10 of those siblings died. Nationally, there has been an uptick incidents this year compared to 2016. Although the number of fatalities remains close, the number of incidents and number of injuries have increased significantly.